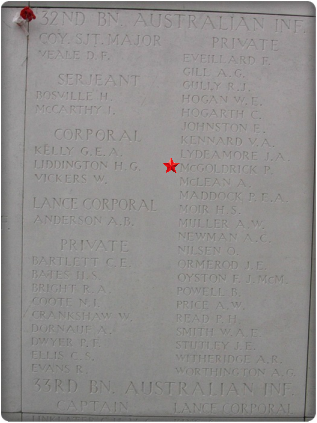 Son of Arthur & Ann Jane McDade, 1st Corgary, Aghyaran, Castlederg, Co. Tyrone. Embarked: 18-5-1916, Sydney, N.S.W. 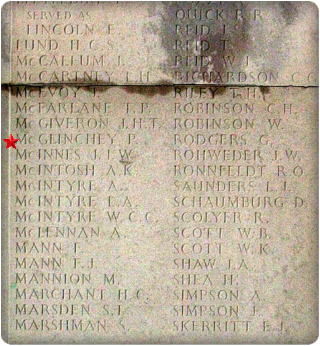 per "Demosthenes"
Embarked: 22-12-1914, Melbourne, Victoria per "Ulysses"
Embarked: 20-3-1915, Melbourne, Victoria per "Shropshire"
Son of Mr. P. McDonald, of Stonefield, Rossport, Ballina, Co. Mayo, Ireland. Embarked: 25-6-1915, Sydney, N.S.W. per "Ceramic"
Husband of Martha McDonald, of 10, Winllan Avenue, West Shore, Llandudno, Wales. Embarked: 1-5-1916, Melbourne, Victoria per "Port Lincoln"
Embarked: 13-2-1915, Brisbane, Queensland per "Seang Choon"
Embarked: 1-5-1916, Brisbane, Queensland per "Clan McGillivray"
Embarked: 22-8-1916, Sydney, N.S.W. per "Wiltshire"
Embarked: 19-10-1914, Melbourne, Victoria per "Hororatat"
Embarked: 4-6-1915, Melbourne, Victoria per "Port MacQuarie"
Embarked: 8-5-1915, Melbourne, Victoria per "Euripides"
Embarked: 20-8-1915 from Brisbane, Queensland per "Shropshire"
Embarked: 13-4-1915, Sydney, N.S.W. per "Kyarra"
Embarked: 22-2-1915, Fremantle, Western Australia per "Itonus"
Son of Timothy and Margaret McGillycuddy, of Carhubeg, Beaufort, Co. Kerry, Ireland. Embarked: 1-9-1915, Sydney, N.S.W. 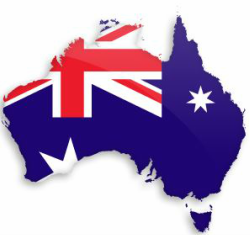 per "Ayshire"
Embarked: 28-3-1916, Queensland per "Commonwealth"
Embarked: 30-10-1916, Fremantle, Western Australia, per "Port Melbourne"
Embarked: 29-6-1915, Brisbane, Queensland per "Aeneas"
Embarked: 12-5-1915, Sydney, N.S.W. 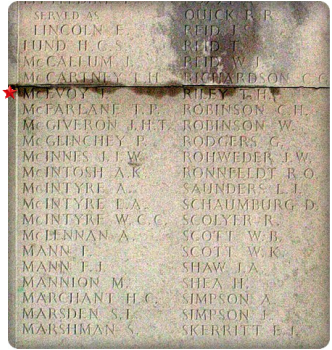 per "Themistocles"
Returned to Australia 4-12-1916 per "Commonwealth"
Re-embarked 24-1-1917 Sydney, N.S.W. 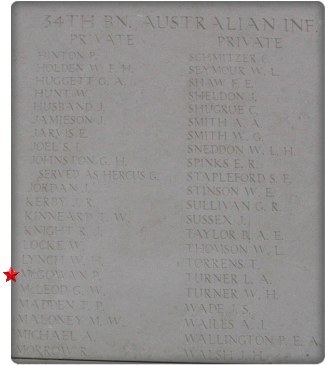 per "Anchises"
Embarked: 17-4-1915, Melbourne, Victoria per "Hororata"
Husband of Madge McGrath, "Killarney", Egerton St., Lidcombe, N.S.W. Embarked: 13-5-1916, Sydney, N.S.W. per "Beltana"
Embarked: 27-1-1916, Melbourne, Victoria per "Hymettus"
Embarked: 30-3-1916, Sydney, N.S.W. 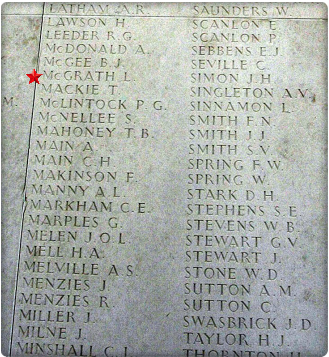 per "Star of Victoria"
Son of Patrick & Margaret McGrath, of Raff St., Toowoomba, Queensland. 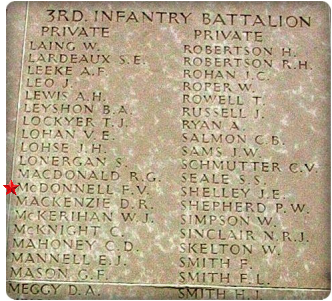 Son of John and Sarah McIlwaine, of Leongatha, Victoria, Australia. Embarked: 22-12-1914, Melbourne, Victoria per "Themistocles"